Mathew J. Nethumpara, who claims to be the lawyer for Kolkata High Court sitting Judge Justice C. S Karnan, approached President Pranab Mukherjee and filed a petition on Friday, seeking suspension of the Supreme Court order sentencing Karnan to six months imprisonment for contempt of court. Nethumpara pleaded to exercise the jurisdiction invested in his Excellency under Article 72 of the Constitution and suspend or stay the operation of the order dated May 9, passed by the Supreme Court convicting and sentencing the petitioner Justice Karnan. 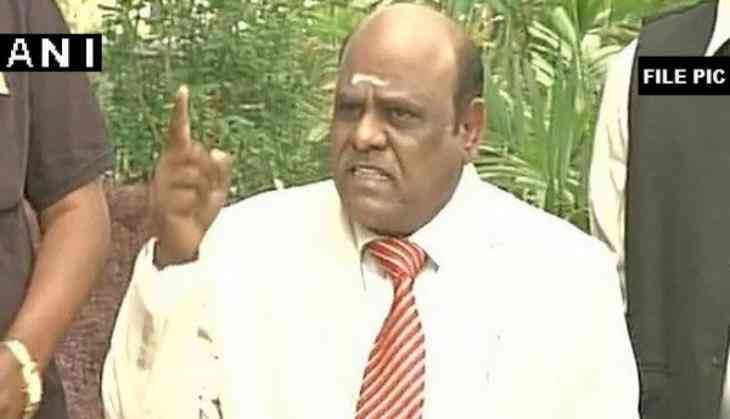 The apex court in its order had in May 9, convicted and sentenced Justice Karnan to six months imprisonment for contempt of court. It was a landmark ruling, as it is for the first time ever that a sitting High Court judge has been sentenced. The May 9, order of the Apex Court subsequently had been challenged by Nethumpara, who claimed to be the lawyer of Justice Karnan. He mentioned the matter before the five Judge Constitution bench, which said we would hear your prayer but not at this time. Justice Karnan earlier sentenced the Chief Justice of India and six other apex court judges to five-year rigorous imprisonment after holding them guilty under the SC/ST Atrocities Act-1989 and amended Act of 2015. Along with the Chief Justice of India, six judges - Justice Dipak Misra, Justice J. Chelameswar, Justice Ranjan Gogoi, Justice Madan B. Lokur, Justice Pinaki Chandra Ghose and Justice Kurian Joseph - had initiated suo motu contempt proceedings against Justice Karnan in February after he had named 20 "corrupt judges," seeking a probe against them. Justice Karnan had alleged this was done because he is a Dalit. Justice Karnan earlier on May 2 directed the court's registrar to issue non-bailable warrant against these seven Supreme Court judges. He tagged the apex court judges as 'accused' for not being present.